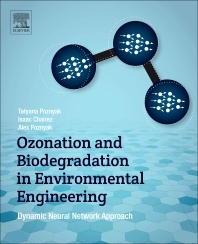 Ozonation and Biodegradation in Environmental Engineering: Dynamic Neural Network Approach gives a unified point-of-view on the application of DNN to estimate and control the application of ozonation and biodegradation in chemical and environmental engineering. This book deals with modelling and control design of chemical processes oriented to environmental and chemical engineering problems. Elimination in liquid, solid and gaseous phases are all covered, along with processes of laboratory scale that are evaluated with software sensors and controllers based on DNN technique, including the removal of contaminants in residual water, remediation of contaminated soil, purification of contaminated air, and more. The book also explores combined treatments using both ozonation and biodegradation to test the sensor and controller. Tatyana Poznyak is with the Section of Graduate Studies and Research in the National Polytechnic Institute of Mexico-ESIQIE. She has been a regular member of the Mexican Academy of Sciences since 2004 and Member of National System of Researchers, SNI-II, since 1994. She is also a member of the "International Ozone Association" (IOA-PAG) - since 1998 and Active Member of the Chemical Society of Mexico - from 1997 to date. Her current researching interests are in Environmental Chemical Engineering and Ozone application in biochemistry and medicine. She directed 12 PhD’s as well as 24 Master degree theses. She has published 76 articles in journals and 7 chapters in referred books. She has presented 160 papers in international conferences and 63 in national congresses. She is the author of 8 international patents. Isaac Chairez has served as full time professor over the last 15 years in the Professional Interdisciplinary Unit of the National Politechnique Institute (NPI). He has published 76 papers in referred journal included in the JCR. Over the last ten years, Dr. Chairez have been working on projects oriented on bioengineering. His research focus is on new Artificial Neural Network methods to solve a wide range of engineering problems from adaptive control of uncertain systems to new methods to classify patterns in electrophysiological signals. In particular, he now aims to develop embedded forms of these networks in order to evaluate their workability on real life problems. Alexander S. Poznyak has published more than 200 papers in different international journals and 13 books including 2 for Elsevier. He is Fellow of IMA (Institute of Mathematics and Its Applications, Essex UK) and Associated Editor of Oxford-IMA Journal on Mathematical Control and Information. He was also Associated Editor of CDC, ACC and Member of Editorial Board of IEEE CSS. He is a member of the Evaluation Committee of SNI (Ministry of Science and Technology) responsible for Engineering Science and Technology Foundation in Mexico, and a member of Award Committee of Premium of Mexico on Science and Technology. In 2014 he was invited by the USA Government to serve as the member of NSF committee on “Neuro Sciences and Artificial Intelligence”.